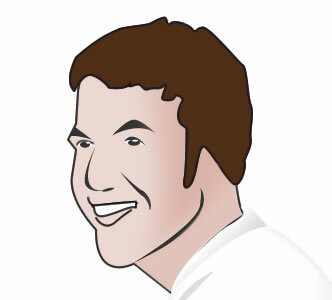 I was working on some myspace-related stuff today which required me to draw the infamous photo of Tom, Myspace's founder. I got a little creative with it and decided to create the above webcomic. We all know myspace is terrible, so I'll spare you a lengthy blog post about all the things that are wrong with that abomination they call a website. Instead, I'll talk about designer stuff. I'm trying to get better at using simple lines and shapes to represent things visually. With Fireworks I'm at a slight disadvantage because I can't simulate pressure when drawing with the pen tool, so I have to kind of hack it and manually draw thicker lines where needed. Normally, when a line simulates pressure it gets thicker around curves in the same way that a pen would. Photoshop and Illustrator both have this feature, and if I'm serious about doing more of this type of design I really need to get on the bandwagon and start using Illustrator full-time. Too funny. BTW, your site is beautiful. 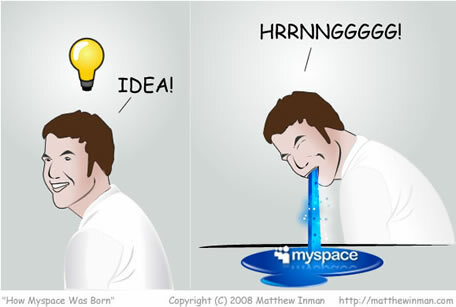 How Facebook was born: Same thing. Zuckerberg vomiting, but the vomit is more pretentious-looking. Just joking, Facebook fans.